Hank O'Day became the most recent umpire inducted into the National Baseball Hall of Fame and Museum on Sunday, a feat only shared by umpires Al Barlick, Nestor Chylak, Jocko Conlan, Tom Connolly, Billy Evans, Cal Hubbard, Bill Klem, Bill McGowan and the most recent inductee, Doug Harvey who was elected in 2010. 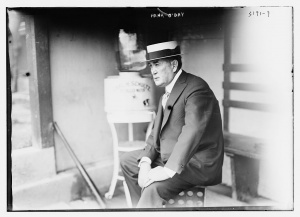 Umpire Henry "Hank" O'Day is a 2013 HOF Inductee. Born in Chicago in 1859, Henry "Hank" O'Day began his professional baseball career as a player with Toledo in 1884 before pitching for the 1885 Pittsburgh Alleghenys, '86-'89 Washington Nationals and '89-'90 New York Giants, leading the Giants to an NL pennant in 1889. Like several other players of the time, O'Day took his turn at umpiring while not pitching and grew to enjoy the craft, earning a spot on the National League staff in 1895 before working 100+ games per season regularly beginning in 1897. Over his 35-year umpiring career—not including the 1912 or 1914 seasons which were spent managing the Cincinnati Reds and Chicago Cubs, respectively—O'Day punched his ticket to 10 World Series, including the first Fall Classic in 1903, and called three no-hitters (May 1, 1906 [Johnny Lush], May 11, 1919 [Hod Eller], July 17, 1924 [Jesse Haines]) before retiring in 1928 after nearly 4,000 games. He served as a league umpire scout in 1929 and 1930. O'Day is credited with turning umpiring from a rules-related necessity into an honorable profession, serving his sport with the courageous conviction to make the right call even in the face of incredible adversity. O'Day survived a plethora of verbal and even physical abuse and finished his umpiring career with 191 ejections. He was never ejected as a player nor manager. O'Day died July 2, 1935 in Chicago at the age of 75. The speech delivered by his great great nephew today was very moving. 191 ejections. Everybody was there to watch him. #umpshow. Ruining the game. Imagine how much better off baseball would be if they had instant replay back then. Sadly, even though the guys working now are probably far better at the craft, I don't think there will be another umpire in the hall of fame. Social Media, the media in general, and society as a whole won't let it happen. I don't think he makes it in the hall of he wasn't a player and manager as well. Thanks for giving the nice information about San Francisco VIN Check.